Vitamin supplements, gym memberships, hot yoga, running, Zumba, kickboxing and the latest green juice concoction are all just a few things that we may obsess about in our daily quest for better heart health. Recent medical research studies have found that you may already have a key to the battle against heart disease right on your bathroom sink. That key may just be your toothbrush and floss. Without a good daily regimen of brushing and flossing, bacteria accumulate on your teeth and can cause gum or periodontal disease. Your body in turn launches an inflammatory response to the bacteria and toxins found in the presence of the gum or periodontal disease. Over time, if the inflammation is not eliminated and is allowed to become chronic, your heart and other organs become affected. According to the American Academy of Periodontology, several theories exist to explain the link between periodontal disease and heart disease. One theory is that oral bacteria can affect the heart when they enter the blood stream, attaching to fatty plaques in the coronary arteries (heart blood vessels) and contributing to clot formation. Coronary artery disease is characterized by a thickening of the walls of the coronary arteries due to the buildup of fatty proteins. Blood clots can obstruct normal blood flow, restricting the amount of nutrients and oxygen required for the heart to function properly. This may lead to heart attacks. 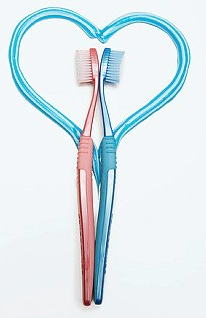 The bottom line is that an ounce of prevention in the form of maintaining good oral health with thorough brushing and flossing is worth reducing the risk to your heart health. It is not a difficult decision when you compare the choices. Hmmm? Do I risk potential cardiovascular disease or do I spend a few minutes flossing?